RiparCover - Long lasting (up to 24 hours), non greasy, water-resistant camouflage makeup that can be used to cover healed; scars, burns, birthmarks, pigmentary disorders (vitiligo, melasma, PIH), cover-up of body art tattoos etc - New techniques learnt from a leading plastics clinic and beauty service training facility in Italy. Andrea is Australia's Master Trainer offering training from introductory courses for new students right through to advanced medical tattoo training for experienced cosmetic tattooists and health professionals. 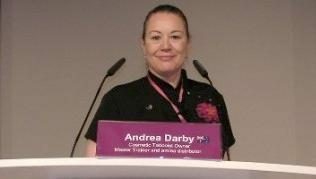 Andrea is offering training in the contemporary techniques being used in leading international centres of excellence for cosmetic tattoo. Philosophy of Business Practice: I do my very best to provide clients with the information that they need to make an informed choice about Cosmetic Tattooing / Micropigmentation. I want all my clients to feel comfortable, safe and happy with the finished result of their procedure. I first completed my Diploma in Beauty therapy in 1985, and later I underwent formal training in Cosmetic Tattooing. Areola Artistry - The latest specialist techniques in Areola complex creation as provided within key hospitals in the United Kingdom. The latest techniques in Medical Tattooing as provided within key hospitals in the United Kingdom. In November 2012 I was invited to appear as one of the Master Lecturers to over 200 of the worlds leading practitioners at the Permanent International Congress (Berlin Nov 2012). The invitation for me to present at the congress was in recognition of the exceptional services I provide here in Melbourne Australia and it was my honour to lecture at the congress and to be the only trainer invited to represent Australia at the prestigious event and my formal recognition as an elite International Master Trainer. In August 2013 I was invited by Reed Exhibitions to present an educational lecture and demonstration at the Sydney Spa & Beauty Expo, this was the first time that Cosmetic Tattooing had featured at the expo and it was an honour to be identified as the regional Master Trainer to present to the wider industry. In September of 2014 I provided Medical Tattoo training service to one of the USA's leading Plastic & Reconstructive surgeons and his clinical/surgical team. In October 2014 I provided a presentation as one of the Master Lecturers and also sat in the panel of experts at the American Academy of Micropigmentation conference in Miami-Bahamas. The invitation for me to present at the congress was in recognition of my status as an international expert in Micropigmentation and it was my honour to be the only trainer invited to represent Australia at the prestigious event. I am a Diplomat of the American Academy of Micropigmentation a Board Certified Member (FAAM) and as of November 2014; I am Australia's only AAM Board Certified Micropigmentation Instructor (CMI). Contribution to the Industry: * 2007 - Co development of a procedural technique that approached clinical methodology. 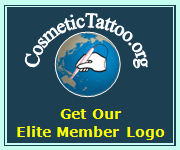 * To help raise the professional standing of Medical Tattooists to that of a legitimate health professional rather than just an ancillary service provider.